Hi my name is Suzanne. 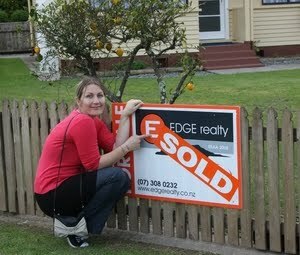 I have with 3 kids and we have just bought our first home-which was a miracle in many ways. Two years ago my dear husband passed away, having a devastating effect on our family. It felt like life was over, no hope. We always wanted to buy a home together, so it was sad and terrifying to try and do this on our own. A friend from church asked if we’ve found a home yet and I said “No, I’m starting to give up hope as there’s nothing out there in our price range”. He asked what exactly am I wanting in a home. I said two things—to be in the town area and to have our own section & driveway. Real estate agents had told me I’d never be able to have both within our price range so he asked me if I could chose one what would it be. I told him I’d love to be in the town area. Well the very next day after having made up my mind it all happened. I walked just around the corner past a home I had often admired and saw the For Sale sign. So I asked the owner, who was painting at the time, how much and he said my exact price range. It had all the things I truly wanted—it was all there, the whole package. He told me that the house went on the market yesterday, the day I made my mind up. I rang his real estate agent and within 5 minutes she was at my door and I was signing papers. The home, the location, Ark Resources, the bank—every area was orchestrated by God. When I got tired and weary from doing it all in my own strength I said “God I’m tired, you take over” and he did better than I could have ever hoped for or imagined. Never give up your hope, your victory, your blessing may be just around the corner! Thank you Lord for our beautiful home. Thank you Ark for helping us the way you did—we are forever grateful. that we should be called children of God!